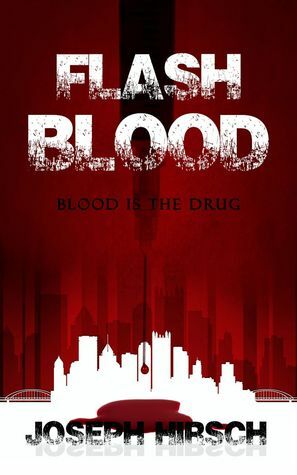 I was really torn over my read of Hirsch’s “Flash Blood”. It starts out so well. James Arklow is a former cop turned detective/criminology professor/PI potboiler author of a ‘certain age’ who is approached by an ex-junkie – an ex-junkie with tons of money, and an offer of hundreds of thousands of dollars if Arklow will locate a single person. Thaddeus Smith is an ex-soldier who Dan Maple is desperate to find. And he will do anything – anything – to find Thad. For Thad is very special, in a very terrible way. The story is very noir – the older detective, the sidekick, the gritty story line. The descriptive narrative is extremely well done, the character development is wonderful. That all works well, right up until the last few chapters. Then, in my opinion, it runs off the rails. There is no answer to some important questions – especially the question of how Thad’s blood wound up being so incredibly addictive. There is also a rather oddball twist to the ending that, to me, turned this from exceptional noir to something more akin to a 70’s model Batman cartoon. I found it disappointing. It almost felt like the author was on a roll – and then suddenly he ran out of steam, lost his concentration, and just gave up. What could have been a 4-star dropped a full star for me, which is a shame. I read his Kentucky Bestiary and truly enjoyed it (Oddly attractive, oddly odd. . ., October 11, 2014). Possibly, at another time, I will give it another read and feel differently about the ending. Until then, I will stick by my 3-star rating as compared to my 4-star KB review. I received the book from the author in return for a realistic review. All thoughts are my own. If you enjoy my reviews, please leave a “Yes” response on Amazon. Thank you!